Born in Cairo, Egypt, Suzan Salwa Saba Habachy has thrived as she worked to reach her goal of helping those in the developing world reach economic sustainability. She credits her success to her education; after attending American University in Cairo from 1951 to 1952, she came to the United States and earned a Bachelor of Arts from Bryn Mawr College in 1954. She furthered her academic knowledge in 1956, when she earned a Master of Arts from Harvard University. Degrees in hand, Ms. Habachy proceeded to serve as a teaching fellow at Ohio University from 1957 to 1958 and an economist at Mobil Oil Co. in New York City from 1959 to 1964. Her unique background and firsthand understanding of the field made her quite the asset to Petroleum Intelligence Weekly in New York City between 1964 and 1965 and McGraw Hill News Bureau in London, England, between 1965 and 1968. She served both publications as an editor and reporter. In 1969, Ms. Habachy joined the UN, where she stayed as a program officer until her promotion to section chief in 1975. She served in that position until 1988, when she transferred to office of personnel at the United Nations Focal Point for Women, which is committed to the improvement of the status of women in policy formulation, advocacy for work/life balance, and grievance redress in employment. Her time there concluded in 1993. Ms. Habachy’s experiences led her to her most recent role as the executive director of Trickle Up, a nonprofit international development organization that helps women gain the skills and confidence to achieve economic self-sufficiency. Trickle Up reaches the poorest and most vulnerable people of the world including women, indigenous people, refugees, and people with disabilities. 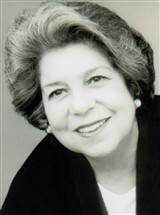 Ms. Habachy worked with the group from 1994 until her retirement in 2001. As a testament to her her accomplishments in her field of economic development, Ms. Habachy received the Who’s Who Lifetime Achievement Award, and was featured in numerous editions of Who’s Who in America, Who’s Who in the World, and Who’s Who of American Women. In her spare time, Ms. Habachy enjoys attending the theater, reading, and traveling. If she could offer some advice to the younger generations, it would be to acquire as much experience and education as possible.